I've written before about the unique suffering of the Japanese people under the last reign of fascists. Others have written about President Obama's "pivot to Asia" and what that was likely to mean for the nation most colonized by U.S. military and corporate presence since WWII. Think General Electric and all those nuclear reactors. Think Trans-Pacific Trade Partnership, more commonly known as the TPP. Think Fukushima and Hiroshima in the same sentence. Now that the pivot's warhawks are coming home to roost, the nation with the constitutional ban on military aggression encoded in Article 9 is experiencing what some have called a coup d'etat. This staged act of violence at the podium of Japan's parliament involved, not opposition parties as was reported in the corporate press, but underlings of the ruling Liberal Democratic Party and its allies. Its purpose was to ram through a law rescinding Article 9 without debate or a roll call vote. Mission accomplished! TV Japan’s report: ”members of the ruling and the opposition parties are running to the chairman’s desk.” “They are trying to stop the decision by physical force.” The TV Japan’s “Wake Up Plus” report is wrong and problematic; the reality was totally opposite of what they have reported. The Chairman Konoike sat down, followed by Fukuyama board member, Sato (State Minister of Defense), and Mr. A.board member coming toward him in order to have a briefing of the question. That moment, about ten members of the ruling parties rushed to the chairman. This video captured that particular moment. As a result, Sato remained by the chairman’s desk, other two board members were pushed away from the center, and the chairman was completely surrounded by the members of ruling parties only. Hence the reality was “the chairman’s desk was violently occupied by the ruling parties and the meeting was continued without their voice heard by any other representatives in the hall.” In other words, it was the first bill in Japan’s political history, which was steamrolled through by force [emphasis mine]. Protesters opposed to the legislation in the hundreds of thousands have turned out in the streets of Tokyo and other cities around the nation. The package is widely unpopular in Japan. According to polling information released Monday by Japanese publication The Asahi Shimbun, 68 percent of voters in the country hold that the security legislation in the current parliamentary session is unnecessary and 54 percent oppose to the bills. 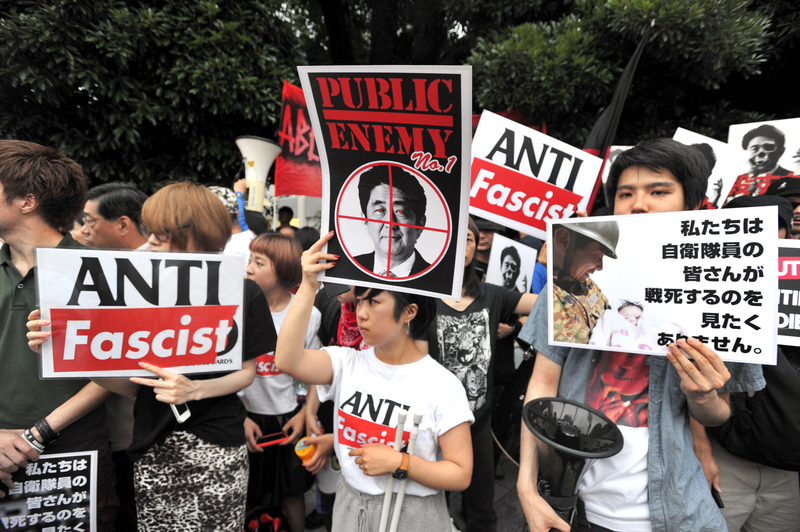 Since Japan already passed a hugely unpopular state secrets act last December effectively muzzling whistleblowers and the press, the road to fascism is well-paved and ready for the tanks to roll. primary resource extraction service for corporate globalization. deploys the ‘shield’ on their doorstep. many European partners have created a “New International Disorder”. led to the killing of many innocent people. Russia’s border that appears designed to destabilize the government in Moscow. Russian border. These provocative developments could be the trigger for WW III. and national movements that resist these US base expansions. 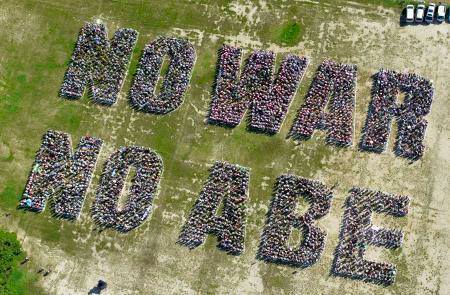 a powerful and unified global movement for peace, justice and environmental sanity. determined action now to ensure that another world may in fact be possible.